* He once played guitar for the Swedish rock band Box Play. * He has a twin brother, Joel, who plays center for the Dallas Stars. * He once was voted the best dressed man in Sweden. * People magazine listed him among the world’s 100 most beautiful people. And he tends some mean goal. The Rangers entered this week as the hottest team in the Atlantic Division because Jaromir Jagr is starting to play, not to mention look, like he eats nails for breakfast; and coach Tom Renney is starting to find who best fits centers Scott Gomez and Chris Drury; and Sean Avery has joined forces with irritants Ryan Hollweg and Colton Orr. But let’s not kid ourselves. 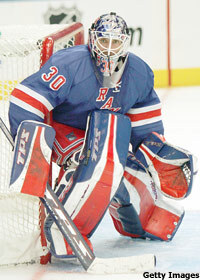 If not for “King Henrik,” fans in the Big Apple would be sour on the Rangers right about now. Instead, the Blueshirts enter this week’s divisional games against the Flyers, Islanders and Penguins with a three-game win streak and a 6-2-0 mark at Madison Square Garden. Lundqvist entered this week on fire, having allowed one or fewer goals in six of his last seven games. His goals-against average was a reed-thin 1.61. He has played every minute of every game for the Rangers this season, which has to make backup Steve Valiquette wonder if he’ll ever see game action. To Rangers fans that have begun nightly chants of “Hen-rik, Hen-rik,” this is no great surprise. They’ve seen this potential since Lundqvist took over for an injured Kevin Weekes on Oct. 8, 2005. Since then, Lundqvist has gone 73-40-18, has twice been a finalist for the Vezina Trophy and has led Team Sweden to an Olympic gold medal. Not bad for a guy taken with the 205th pick of the 2000 draft. At 25, Lundqvist barely is approaching his prime years as a goaltender and could be ready to arm wrestle Martin Brodeur for the Vezina this season. On Saturday, the two netminders battled it out in a classic duel. Lundqvist was brilliant, especially in the third period when he stopped Zach Parise, Brian Gionta, David Clarkson, Mike Rupp and Patrik Elias with a series of remarkable saves. The highlight might have been the stop Lundqvist made on Parise with about four minutes remaining in regulation. Lundqvist raced out of his net to thwart a potential breakaway, but his clearing attempt landed on the stick of Parise, who snapped a shot right at the goaltender. Parise fired his own rebound toward the empty net, but Lundqvist snatched the puck while falling backward onto the ice. "Playing in New York, when you win, everybody's excited to play every game,” Lundqvist said. “I think this time the homestretch was good for us. It came at a good time." Two of the Rangers’ three games against division rivals this week are at the Garden, where Renney has noticed a more focused, more committed team. 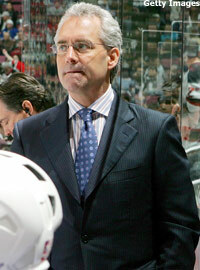 "I think we're certainly a more complete team at home here," Renney said. "We certainly feel a deep obligation to play well here and what we have to continue to do is play within a system that allows us to win first and foremost." will result in more offensive production. After weeks of tinkering without much success, Renney seems to have found some chemistry with his forward lines, even if it has not resulted in a surge of offense. Renney split up Gomez and Jagr, putting Jagr on a line with aggressive rookie Brandon Dubinsky and Marcel Hossa. The new look seemed to have the intended results because Jagr has been playing more like a power forward than a dazzling playmaker. And he’s starting to look the part, too. Jagr’s million-dollar smile was reduced to a box of Chiclets last week when he took a puck in the face, then led the Rangers to a 3-1 win over the Lightning. Gomez, meanwhile, is centering a dash-and-crash line with Avery and Petr Prucha; and Drury is centering a better than your average checking line with Nigel Dawes and Shanahan. The Rangers’ fourth line is among the chippiest in the League, with Blair Betts between Hollweg and Orr. And their defense, considered suspect in most preseason rankings, had allowed just 23 goals, tied for the League’s fewest, through 13 games. The Rangers’ penalty killers have been stingy as well, shutting down 19 consecutive power-play opportunities entering this week. It all begins, however, with the guitar playing, sharp dressed man between the pipes. Around the Atlantic -- The Flyers are expected to have Simon Gagne back in the lineup this week after the high-scoring winger missed almost two weeks with a concussion. Following this week’s games against the Rangers, Penguins and Devils, the Flyers will play 37 of their final 67 games on home ice. The Flyers are 8-0 when allowing three goals or less; 0-4 when allowing four goals or more. … Not surprisingly, there was only one person on Long Island over the weekend who didn’t believe Al Arbour played a prominent role in the Islanders’ dynasty of the early 1980s – Arbour himself. “I was very touched. But I didn't really do much," he said after the banner celebrating his 739 victories was replaced by one trumpeting his 1,500 games behind the Islanders bench. Current Isles coach Ted Nolan knows better. “Just by him being here, he won the game for us,” Nolan said of the Isles’ 3-2 win over the Penguins. … The Devils have scored two goals or less in seven of their first 13 games, going 0-6-1 in those seven games. Martin Brodeur entered this week two wins shy of his 500th career victory. Free-agent pickup Dainius Zubrus still is looking for his first goal. … Penguins right wing Colby Armstrong was benched over the weekend after starting the season with one goal in his first 12 games. The Penguins are in the midst of nine straight games against Atlantic Division opponents.